When spring comes to the Arctic, the breakup of the cold winter ice sheets starts at the surface with the formation of melt ponds. These pools of melted snow and ice darken the surface of the ice, increasing the amount of solar energy the ice sheet absorbs and accelerating melt. 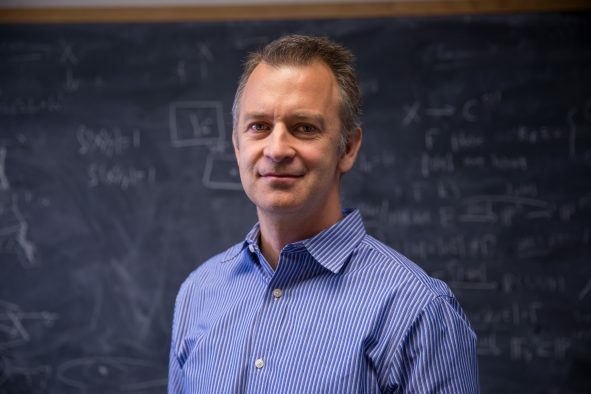 A team including University of Utah mathematician Kenneth Golden has determined how these melt ponds form, solving a paradoxical mystery of how a pool of water actually sits atop highly porous ice. Their results are published in Journal of Geophysical Research – Oceans. water level in the pond as it drops. Golden studies the dynamics of sea ice, which is a composite system of solids and liquids of varying salinity and chemistry. 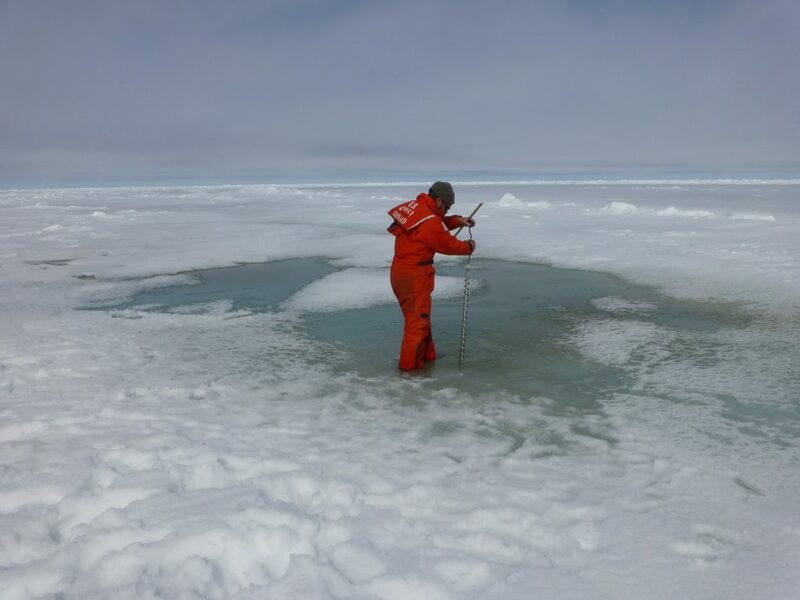 Melt ponds are a focus of his research because they dramatically affect the albedo, or reflectiveness, of the sea ice, one of the most important parameters in climate modeling. They also may allow more light to penetrate through the ice, allowing algae to proliferate in the seawater beneath. In 2014, Golden, along with study first author Chris Polashenski of the U.S. Army Corps of Engineers Cold Regions Research and Engineering Laboratory and colleagues traveled aboard the U.S. Coast Guard cutter Healy to the Chukchi Sea, between Alaska and Siberia, to investigate massive algae blooms below the ice, which had been first observed in 2011. As part of their study they needed to measure the permeability of the ice. Permeability is a measure of how well interconnected voids and channels within a material allow fluid to flow through. 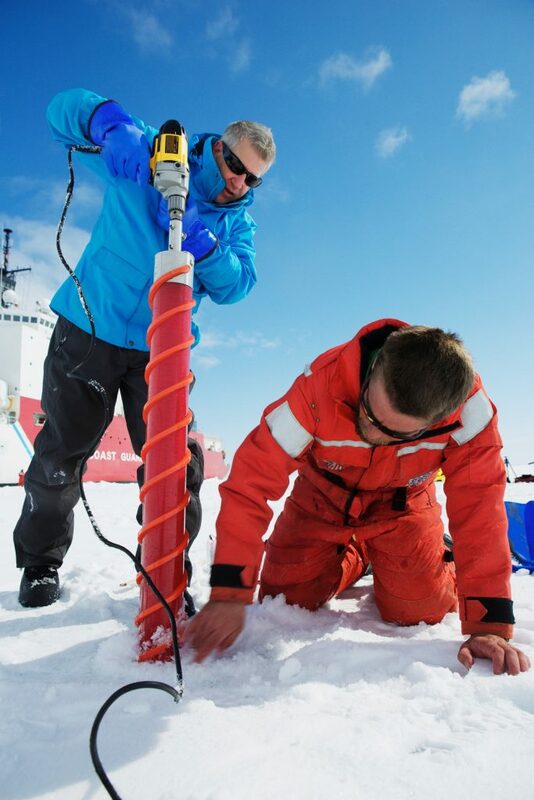 Ken Golden drills a sea ice core to measure fluid permeability of the porous ice, as Chris Polashenski clears away the excess snow and ice. Their first attempt involved drilling a hole in the ice down below the “freeboard level,” or water table, to see how quickly the water filled the hole back in. 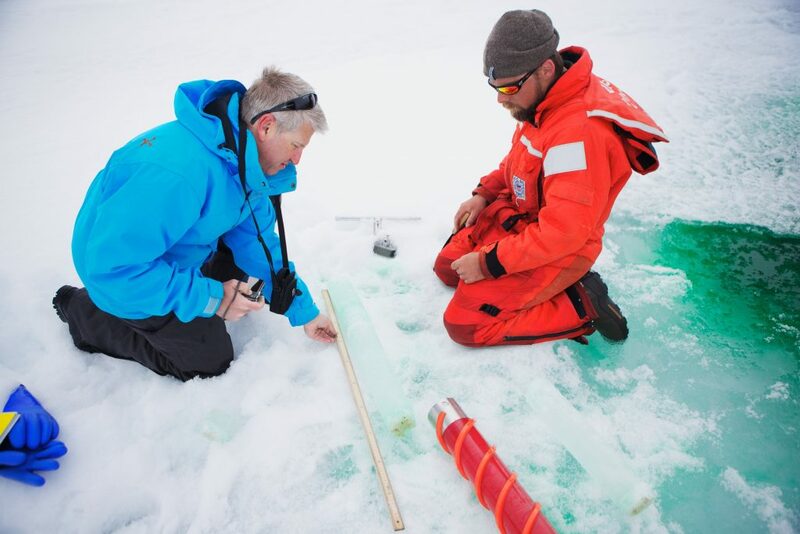 “It filled up to the freeboard level in about a second and a half,” Golden says, indicating the ice was too permeable to make a measurement. Next, the team tried to add water to the hole to see how quickly the water level re-equilibrated to the freeboard level. They planned several attempts, and noticed that in the second attempt, the water level fell much more slowly than in the first attempt. “And then the third time was the charm,” Golden says. The team poured water into the hole and the level didn’t go down at all. “We formed a melt pond!” he says. Intrigued, the team tested different levels of water salinity in boreholes and used dyes to trace the progress of the water through the ice. (The team used red and green food coloring from the Healy’s kitchen, Golden says). All of their experimentation pointed to a clear mechanism for melt pond formation. 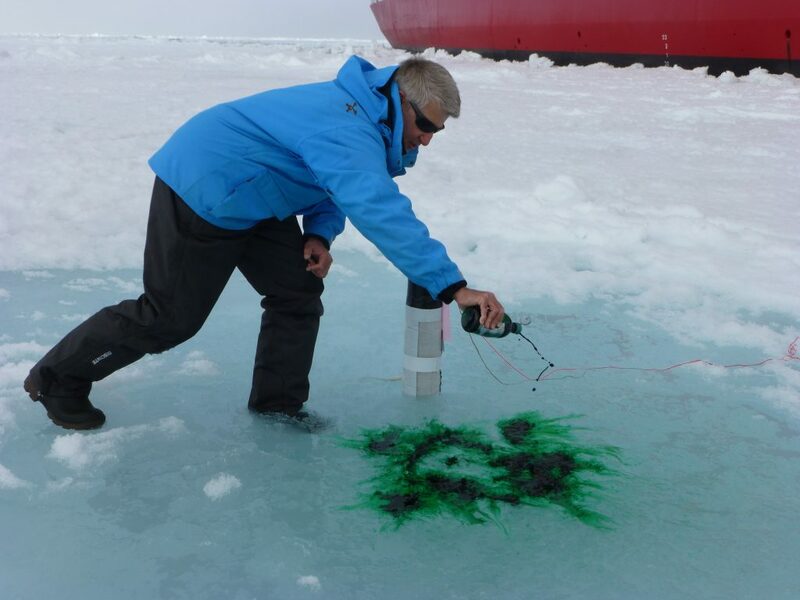 Ken Golden spreads green dye in a melt pond to test seepage of the pond water into the upper layers of the sea ice. 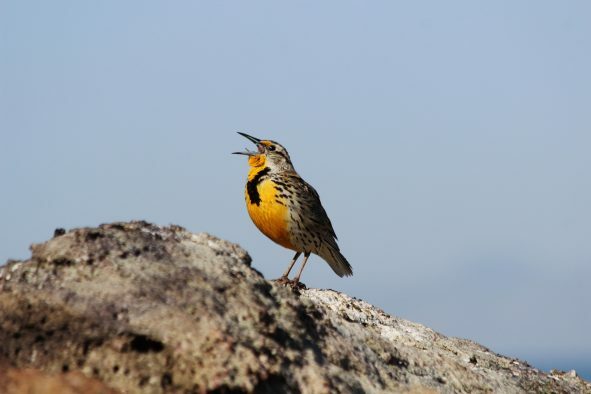 “The freezing point of the fresh meltwater from snow is zero Celsius,” Golden says. “But the ice itself is maybe -1 or -1.5. The freezing point of seawater is -1.8. So basically, you’re getting this infusion of fresh water and there’s enough cold there to clog up the pores. 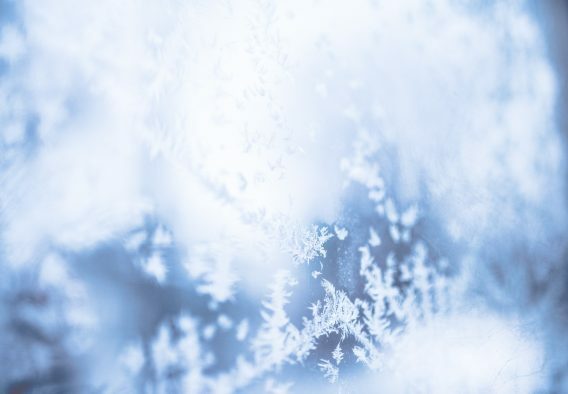 You’re lowering the permeability of the ice by this process of freezing freshwater plugs into the porous microstructure.” With lowered permeability, the meltwater can form a pool on top of the ice. Others, including Polashenski, had speculated that such a process might be behind melt pond formation, Golden says, but that his team was in the right place at the right time with the right equipment to put the story together in the field. 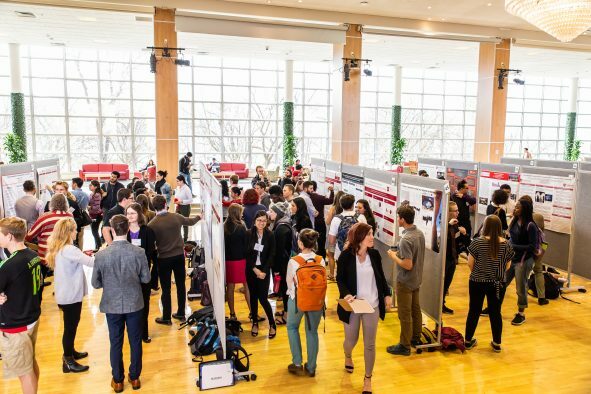 Hopefully, he says, understanding the conditions that lead to melt pond formation can help scientists predict where and when ponds might form as Arctic temperatures continue to rise. Ken Golden measures the depth of dye seepage into the sea ice underneath a melt pond as Chris Polashenski looks on. Hear Golden and Polashenski on the Arctic ice in this 2014 radio story. 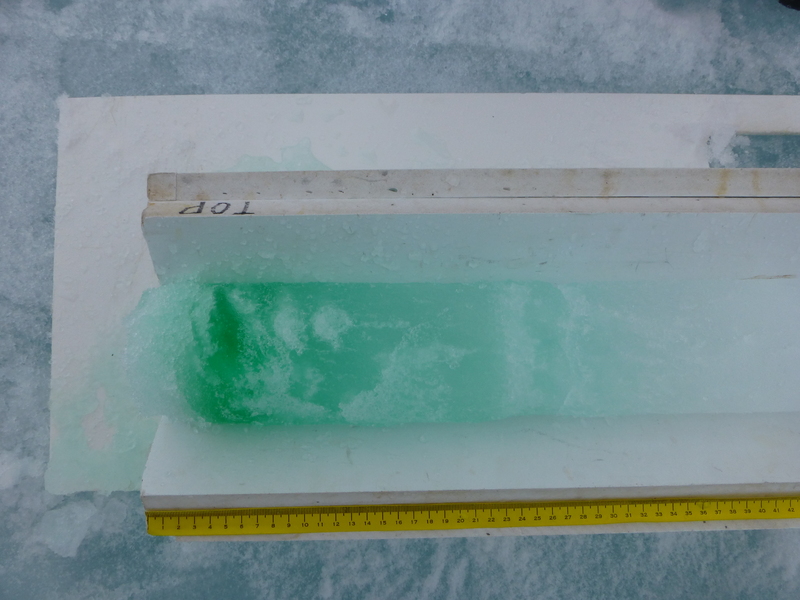 A sea ice core extracted from an area where green dye was spread over the snow and ice surface. The dye penetrated well into the upper layers, but then stopped.